The EPA considers household hazardous waste (HHW) “leftover household products that contain corrosive, toxic, ignitable or reactive ingredients… Products such as paints, cleaners, oils, batteries, and pesticides” as well as herbicides and poisons. Improper disposal of these items include pouring them down the drain, throwing these items in an everyday trash receptacle and dumping in to storm sewers. Consider reducing your household hazardous wastes properly with a household hazardous waste facility. Household hazardous wastes should not be disposed of in landfills because of the toxic properties that they contain. These hazardous products can be detrimental for the environment and human health if disposed of improperly. U.S. Chemical Storage provides proper waste recycling and waste disposal techniques with household hazardous waste facilities. The goal of having a household hazardous waste facility on site is to provide proper disposal of hazmat waste, remove hazardous materials from homes to prevent potential accidents, reduce danger to waste collectors, reduce costs, and educate the general public of environmental concerns of improper disposal. Reuse and recycling: Many HHW products may be reused by other people or institutions that are recycled. The most popular recycled products are lead-acid batteries, paint, used oil, and anti freeze. These products can cause serious harm to the environment if they are not properly discarded in a household hazardous waste facility. Designed to compliantly handle corrosives, flammables and toxic materials, household hazardous waste facilities by U.S. Chemical Storage will offer ultimate safety to your community and residents in your county. Custom build design to meet your exact specifications. Most household hazardous waste facilities are three compartmental buildings separated with solid partition walls for chemical segregation. This provides an organized solution to group chemicals, in order to avoid reactivity. All HHW facilities are constructed from heavy duty, 12-gauge steel for superior strength and ultimate durability features. 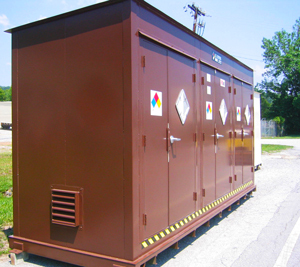 All chemical storage buildings are 100% customizable and 100% compliant for exceptional satisfaction. Meets and exceeds all EPA, OSHA and NFPA regulations.